Watersports enthusiasts will love this brand new 2014 Galeon Galia 650 Sun Deck. 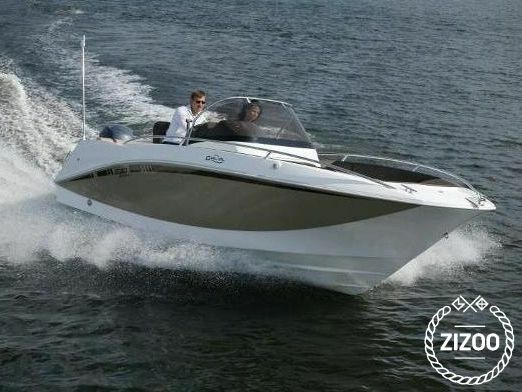 Sleek and attractive design makes her a real eye candy that provides all the comfort you need for a fun day out at sea. Adrenalin buffs who would like to rent some equipment to go out and test their skills can do so at the charter's base Marina Punat. If you are not such an active type, her large upholstered sundeck offers plenty of space to relax and soak up the sun. Swim ladder enables easy access to sea, and there's a shower fitted to wash down the salt before you get back to tanning. She can take up to 6 people for exploring nearby beaches, and there's a small foredeck cabin if some of you want a nap out of the sun. If you want to make it a full day, bring some snacks and drinks, pick her up from 9 am and have a great time!